The Bamboo Cremation Urn is perfect for the person who was environmentally conscious. The bamboo used to make these urns has gone through a process that causes the bamboo to caramelize to a warm brown color. A strip of end cut bamboo is inlaid around the top rim for a touch of elegance. 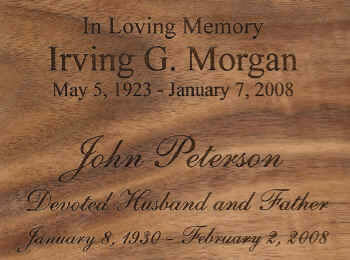 The urn can be personalized with up to three lines of engraving. Please limit engraving to no more than 35-40 characters (letters/numbers/punctuation/spaces) per line. Check spelling, punctuation, capitalization, and dates to make sure they are correct; you will not receive a proof. This urn can be engraved on the top or front. Urn usually ships 2-4 business days after order is placed, even for expedited orders.